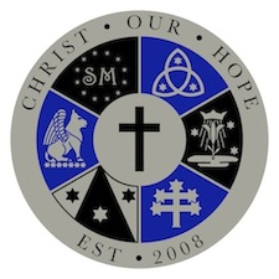 The outer rim carries the words “Christ Our Hope,” as well as the year the Cluster was formally established. In the center is the cross, showing that we are all connected in Christ. Additionally, each color of the logo also has a symbolic meaning. In the ancient tradition of heraldry, the color silver denotes peace and hope; we find our peace and hope in Christ. Blue represents truth and loyalty; as a Cluster, we live the truth of the Gospel and remain always loyal to our Catholic faith. Black denotes constancy; here, it reminds us that our hope in Christ endures forever. The six inner sections contain representations from each of our parishes. Saint Mary, Waucoma: In the top left corner twelve stars surround the initials SM, which stand for Sancta Maria, Latin for Holy Mary. The twelve stars represent Our Lady’s crown of stars as described in the Book of Revelation. St. Luke, St. Lucas: In the left is a winged bull, which from ancient times has been the iconography proscribed to the Gospel writer Luke. Our Lady of Mount Carmel, Lawler: In the bottom left is the seal of Mount Carmel. The mountain in the middle is Mount Carmel itself, reaching to Heaven. The three stars represent the three periods of time associated with Mount Carmel. Holy Trinity, Protivin: In the top right corner is a Trinitarian knot, representing one God in three distinct persons. Assumption of the Blessed Virgin Mary, Little Turkey: In the right a lily on a cloud receives a crown in radiant light. The lily, which often represents Mary’s purity, is assumed into Heaven and crowned, showing Our Blessed Mother’s queenship of Heaven and Earth. St. John Nepomucene, Fort Atkinson: In the bottom right five stars are mounted on each branch of a palm leaf, the traditional symbol of martyrs. Today, this symbol marks the place where St. John was thrown into the Vltava River.